A new report shows that students from 196 Wisconsin high schools were required to take remedial math or English when they entered the UW System as new freshmen in the fall of 2017. Students from more Wisconsin high schools are entering the UW System woefully unprepared. Half of all five-star high schools show significant issues with remedial education. The report, published by the UW System, shows the extent to which the K-12 education system is failing students. Rather than demonstrating mastery of material before graduating high school, thousands of students are moving through the system and arriving at college unprepared. Students taking remedial-level classes pay full tuition for the courses, but receive zero college credit. The classes do not count towards degree completion, and students must pass them before moving onto regular coursework. The issue plays into the trend of increasingly high levels of student loan debt, and the amount of time it takes college students to earn a degree—if they finish at all. Studies show that students who take remedial classes in college are also less likely to graduate, leaving them with thousands of dollars in debt without a degree. The report tracks the number of students from each Wisconsin high school who were required to take remedial math, English, or both. Students have a tougher time meeting math requirements, with 195 schools on the list graduating students needing additional math instruction. Fifty-six schools sent students needing English remediation, while 55 schools sent students that needed both math and English. Of the 196 schools on the list, 14 are private schools, and 182 are public schools. One hundred and eighty-five schools graduated classes where 10 percent or more of the students starting at UW needed remedial math instruction. That’s an uptick from the previous year’s report, which showed that 172 schools graduated classes where 10 percent or more of students needed remediation. Eleven schools sent classes to UW where 50 percent or more of the students required remedial math. That’s an improvement from 2016, when 15 high schools met that criteria. Of those 11 schools, five are part of the Milwaukee Public Schools district, the largest in the state. At 80 percent, Royall High School had the largest percentage of its graduating class needing math remediation. The high school to send the most individual students to the UW System needing remediation was Kimberly High School. Out of the 174 Kimberly High School graduates beginning at UW in the fall of 2017, 67 needed remedial math classes, a rate of 38.5 percent. Ten of those students, or 5.7 percent of the entering freshman class, also needed English remediation. Perhaps most troubling in the report is that many schools on the list had recently ranked highly on Wisconsin’s own report card system. Fifty percent of the high schools who received five stars on Wisconsin’s 2018 report cards graduated students who needed the remedial classes. 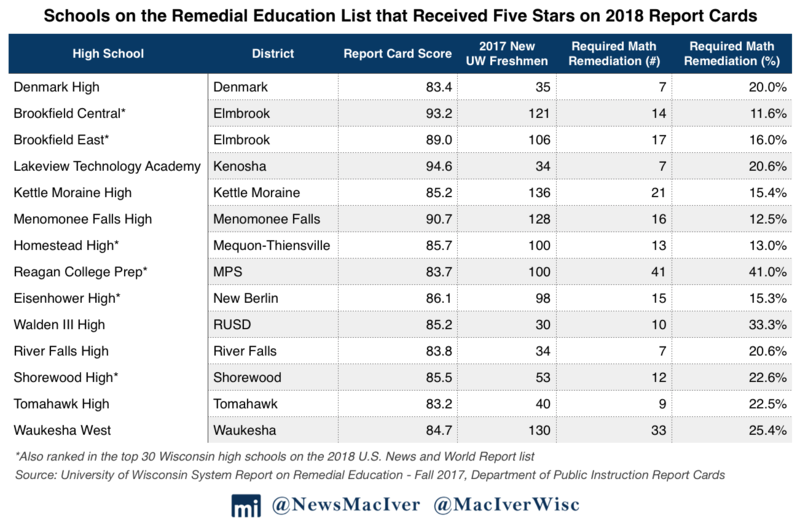 On average, Wisconsin’s “best” high schools graduated classes where 21 percent of students who entered the UW System required math remediation. Those 222 students come from all over the state – Brookfield, Tomahawk, Shorewood, Kenosha, Milwaukee, and many others. Fourteen schools that sent high numbers of unprepared students to the UW System received ranks of five stars, or “significantly exceeds expectations,” on Wisconsin’s 2018 report cards. That’s a significant increase from the prior year’s list, which showed that nine schools with significant remediation needs had received five-star rankings on the most recent report cards. Others still were included on notable lists such as U.S. News and World Report and are purportedly among the best schools in the state and country. Eisenhower High School in New Berlin was ranked the second-best high school in the state by U.S. News and World Report. Fifteen percent of their graduates going to UW needed zero-level math coursework. In fact, nine of the ten best high schools in Wisconsin – according to the U.S. News and World Report 2018 rankings – appear on the remedial education list. The only school that does not is the number one-ranked school, Whitefish Bay High. Of the top twenty schools on U.S. News’ list, 17 had issues with math remediation. Clearly, there is a disconnect between official rankings and student preparedness for life after high school. Students who are told that they attend the best high schools in the state go on to UW behind their peers, requiring help with basic algebra and trigonometry. The report shows a glaring disconnect between official rankings and student success. Fifty percent of the high schools on Wisconsin’s most recent report cards graduated at least six students who needed remedial education at the UW. Of any district, Milwaukee Public Schools (MPS) appeared the most times on the list, with 10 schools. Reagan College Prep, the district’s only five-star high school, sent 100 students to UW in the fall of 2017, and a stunning 41 of those students needed math remediation. Rufus King sent the most students needing zero-level classes to UW that semester out of any MPS school, with 45 of 106, or 42.5 percent of the class, requiring math remediation. At two-thirds of their class, Alexander Hamilton graduated the highest percentage of students needing extra math help of any MPS school. Out of the MPS schools on the list, only the Milwaukee High School of the Arts and Riverside University High School had graduates who needed English remediation in addition to math. Seventeen students between the two schools needed extra English help, and 59 students needed additional math work. Math remediation is in much higher demand than English remediation, but many schools struggled adequately in preparing students for both subjects. Fifty-five schools appear on the list for both English and math remediation. Barron Area High School sent the largest percentage of its students behind on English out of any school on the list, with 38.9 percent of students needing English remediation. Students from that school also struggled significantly with math, with 52.8 percent of its students requiring math remediation. The school received three stars, or “meets expectations,” on Wisconsin’s 2018 report cards. The only high school where students needed English remediation but not math was Pulaski Community High School. Nine of the 90 incoming UW freshmen from that high school required English remediation. None of the 14 private high schools on the report had needs for English remediation. Pius XI High School at MPS sent the largest percentage of students needing math remediation of any private school, with 49.1 percent of its 57 students needing math help. Compared to last year, 12 more schools made the list. Forty-seven schools are new on the list this year, while 33 dropped off from last year. The vast majority were on last year’s list, as well. Remedial education has drawn more attention in recent years, as an increasing number of students require basic levels of math and English when they enter college. The report follows a 2015 law championed by Rep. John Jagler (R-Watertown) requiring the System to publish information on which high schools have the biggest issues when it comes to getting their students ready for college. Schools are only added to the list if six or more of their graduates needed remediation at the UW. College affordability is a hot topic these days, for good reason. The issue of remediation shows that perhaps the necessity of college for all students should be part of the discussion, too. Sadly, statistics show that many of the students needing remediation will simply not finish college, or take more than four years to attain their degree. Still, these students will pay thousands of dollars for remedial classes while receiving zero credit in college. When high schools fail to prepare students for college or beyond, students across the state pay dearly. Oftentimes, as this report has shown, many of the students come from relatively well-ranked schools — at least according to the official rankings. In reality, those students are simply not prepared for college. The MacIver Institute will update this story as more reactions become available.